Hi Everyone, I'm just back from a trip to St. Louis. It was grey, drizzling and cold and what a nice contrast touching back down into San Diego's warmth. The first thing I did off the plane was jump in the wild blue pacific for some equalization. We had a great time with Dianne and the crew creating new songs and mapping out how the new recording will go. There's more work to do but we've got a good beginning. 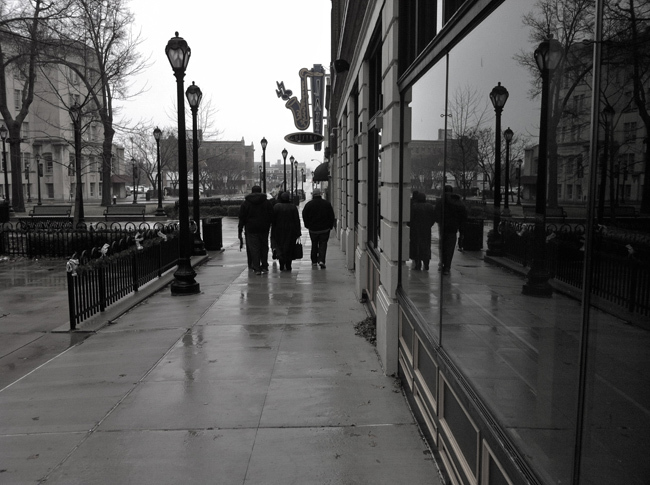 Band taking a lunch break, all bundled up and walking the streets of St. Louis. Dianne sharing a musical thought from the computer. 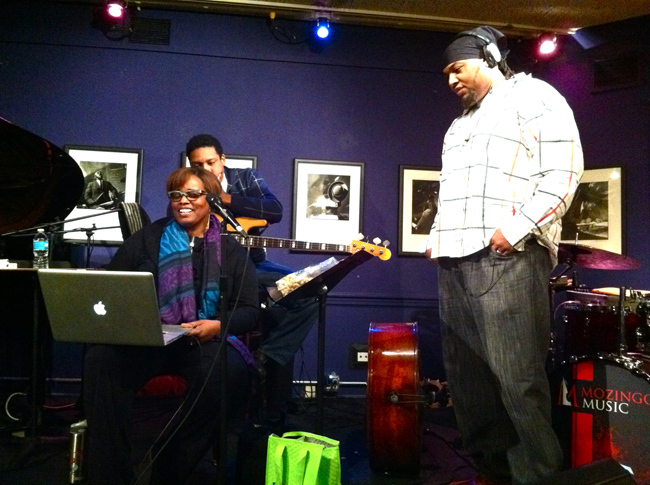 That's Terryon Gulley on the right, Chris Thomas in the back and Dianne Reeves in the front. For this week we've got a cool collection of gigs starting with Monday night at the Calypso with our trio. It's been a fun hang and great way to slide into the new week. Thursday night is me solo guitaring it at the world famous Roxy Restaurant. Come along for the great food and transcendental sonic explorations. On Friday and Saturday nights I'll be playing at Ki's with Fred Benedetti as my guest on Friday and Kevyn Lettau singing with me on Saturday. Big fun! Last for the week, on Saturday afternoon we're doing our big FREE concert with my string group plus a vocal quartet added into the mix. It's going to be a thrill and it's a whole new angle on what goes on inside my brain. Chaos organized with street logic galvanized with a lifelong passion for sound. We're rehearsing the ensemble again tomorrow and I'm thinking I'll take some pictures and share them with you later this week. A little visual inspiration to hopefully motivate you to point the car towards Encinitas and take it all in. Details below. Duncan Moore  drums 7 PM Back years ago I played at the Calypso in Leucadia and it was huge fun. Then they had a restriction that no amps could be used. They redone the place and we can plug in. Hurray! We're gearing up the trio to play every other Monday for hopefully a long stint. 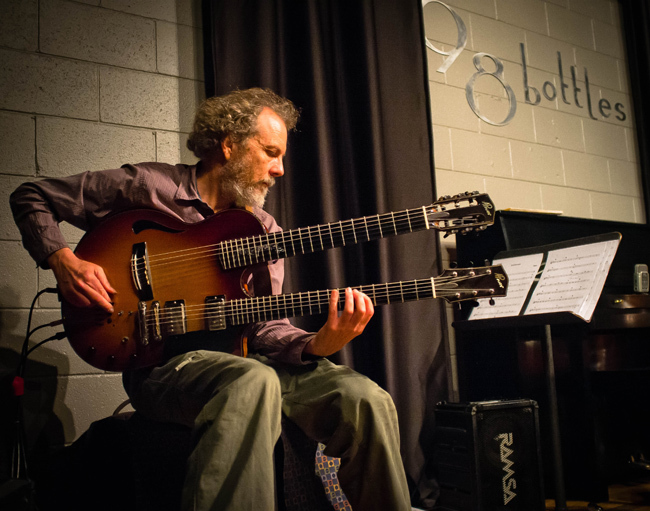 Fred Benedetti  guitar 8:30 PM The twin neck duo! Nina Flowers  vocals 2:30 PM This is a FREE concert and we've gathered an insane band. 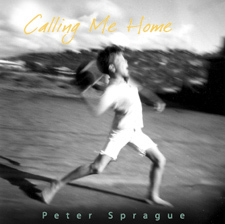 We'll play "The Calling Me Home Suite", "Dr. Einstein's Spin", "Mudra" and others. All of the music is my own and I collaborated with Randy Phillips on the lyrics. This concert is funded in part, by the City of Encinitas and Mizel Family Foundation Community Grant Program. 8:30 PM Kevyn and I stretching the boundries a little. 7 PM This library space has excellent acoustics and it's quite in there! Can't wait! 2 PM Solo guitar and this one is a free concert.